When I made my slow cooker Pumpkin Butter for the first time this season, I had ripe pears on the counter and wondered if pears—and/or apples–could be used totally eliminating the need for an added sweetener. I was mixing up my Pumpkin Butter to slow cook while I slept so I was getting ready to turn in for the night and didn’t do any experimenting then. But I finally got a chance to play around with that idea recently and was pleased with the results. The only down side is that I am sensitive to weird textures and noticed the “seeds” from the pears in the pumpkin butter if I ate it spread on bread. I picked up my pears from the grocery store and don’t even remember what kind they were and I’m guessing that letting them ripen quite a bit more on the counter did not help with the development of stone cells. Hmmm. Pear experts, please weigh in. 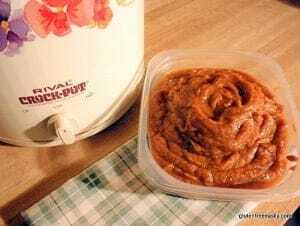 Pumpkin Butter is a key factor in the success of my Pumpkin Spice Bundt Cake, my Pumpkin Butter Pie, Pumpkin Butter Pecan Chocolate Chip Bars, and Pumpkin Butter Salsa Chicken or Pumpkin Butter Swirled with Honey Cinnamon Whipped Cream. Try any of those recipes made with this Pumpkin Butter below (or with my original recipe) or simply slather some on your favorite bread or quick bread (check out quick bread recipes on All Gluten-Free Desserts) and enjoy! Add apple and pears to food processor and process until pureed, about a minute or so. Add puree to medium-sized bowl and add in other ingredients. Mix well. Add mixture to slow cooker. Slow cook on LOW for about 5 ½ to 6 hours. Check on thickness/consistency of your pumpkin butter. When it’s “almost there,” remove lid from slow cooker and leave on for another 30 minutes. Then turn off slow cooker and let sit in slow cooker for another 30 minutes or so. 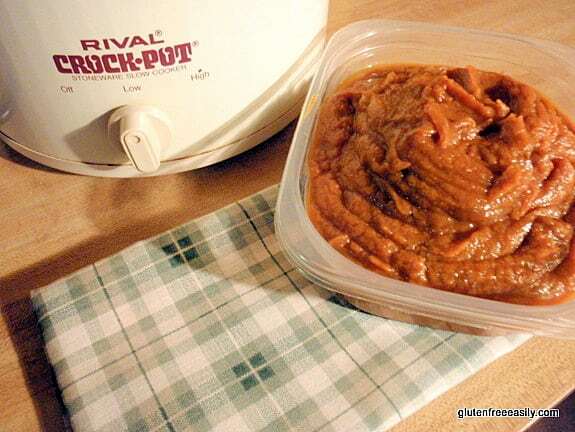 Even though the slow cooker is turned off at this point, the pumpkin butter will continue to cook and thicken from the heat left in the slow cooker and the evaporation process. This part is somewhat intuitive, but not difficult. Once thickened and cool enough, transfer to canning jars or other containers and store in the refrigerator for a few weeks. You can substitute 3 to 3 ½ teaspoons of pumpkin pie spice for the individual spices, "in a pinch" or if you prefer. Subbing pumpkin pie spice for part of the spices (allspice, cloves, ginger, and nutmeg) in addition to cinnamon is also an option. You can use a sweeter apple, like Golden Delicious or Pink Lady, or perhaps even use more apples than pears, or all apples. Adjust honey (or other sweetener) as needed when altering the ratio of fruit and to personal preferences. Slow cooking will deepen the flavors, but it won’t necessarily make your pumpkin butter sweeter so being happy with the sweetness before adding your mixture to the slow cooker is important.Slow cookers can vary in temperatures and required cooking time. You might need to slow cook your pumpkin butter more or less. Pay attention to that final cooking time the first time you make this recipe and note it on the recipe so you won't have to keep checking your pumpkin butter when you make it in the future.Because of the lower amount of sugar in this recipe (honey in this case), this pumpkin butter will not keep as long as my other slower cooker pumpkin butter recipe does or at least keep its same sweet flavor. The fruit turns fairly tart after a while. This post is linked to 5-Ingredient Mondays, Gluten-Free Tuesdays, Centsibly Sugar and Grain-Free, Allergy-Free Wednesdays, Gluten-Free Wednesdays, Gluten-Free Fridays, Whole Food Fridays, and Wellness Weekends. I’ve noticed the gritty texture of some pears, but I never knew it was from stone cells. I always thought that some pears just had different textures. I guess you learn something new everyday. I like how simple this recipe is to make. It’s so much better than buying pumpkin butter from the store with 20+ ingredients and half of them are preservatives and stabilizers. I think this recipe would be able to freeze pretty well. The only issue is that I don’t have a slow cooker. I am sure I could do it over the stove, but it would be much more time consuming for me. Shirley, thank you for sharing your link to your post on making the pumpkin butter. It looks absolutely amazing! And 10 minutes? That has got to be the cherry on top. This sounds yummy with pears! Adding pears sounds good to me. I know what you mean about the texture. That’s one reason I love Asian pears. I wonder how they would be in this recipe. Linda–I tend to pick up pears by which ones look best. I need to be on the lookout for Asian pears now. I’m not really sure which pears I did use in this recipe! Hi Sue–I don’t think I’ve ever officially welcomed you to gfe … I’m happy to have you here! 🙂 That is a really great tip. Thanks so much for sharing it! Yum! What a great addition with the pears! Smart. Thanks for linking at Centsibly Sugar and Grain-Free! First of all, this is a brilliant recipe and this pumpkin butter tastes so good certain members of our household ( 😉 ) have been known to eat it by the spoonful! Since I don’t like the gritty pear pebbles in in it, I just used a couple of apples, and it came out really really great! I cooked it on the stovetop and that was a cinch as well and didn’t require much of my attention. As you already know, the pumpkin poundcake I made with it was such a hit it was gone, literally, within 15 minutes (or less). Yes indeed, this pumpkin butter is awesome! Angela–Hey #1 fan! 😉 I’m so pleased to know that apples worked great in this recipe, and especially that you had no problems cooking it on the stove top. 🙂 I love that your crew is eating this pumpkin butter by itself and enjoying it in recipes! I’ve made apple butter and pear butter on top of the stove, but I like the crockpot idea. The pumpkin sounds good, may have to give it a try. I have about 40 pumpkins available to me through a farmer friend. This is perfect for gifts!!! Thank you so much for sharing 🙂 I love any and all things slow cooker! Kate–40 pie pumpkins?!! I am jealous. They are a lot of work, but it’s good work! 🙂 These DO make perfect gifts for sure! I’ve never noticed the gritty taste in pears and I didn’t know about stone cells, how interesting! Hi Vicky–Thanks! I love it when a healthy recipe works for so many diets! 🙂 I think that some of us are much more sensitive to textures than others. Folks who eat a lot of fruits, especially berries, are much more tolerant of “seediness” than I. 😉 Don’t you love it when we keep learning? It makes my day to learn such tidbits! I love pears, but also don’t love that gritty texture from time to time. This pumpkin butter looks heavenly. Can you believe I don’t have a crock pot? I need to remedy that, right? This looks amazing, Shirley. For some reason I have never attempted to make pumpkin butter before, though I love apple butter so I don’t know why I wouldn’t love this. Still in pumpkin “mode” so anything pumpkin is OK with me right now!